The US has become a virus-ridden country. Only a few people have survived being turned into flesh eating zombies. Our protagonist, Columbus, is a young college student with a lot of hang ups and phobias. He’s a loner with a long set of rules that save him from being turned into a zombie. And he wants to find love – well he did before he had to dodge zombies to stay alive. Woody Harrelson plays Tallahassee, who has his own very different set of rules and when he meets Columbus, they team up to cross the country together. They eventually meet some sisters on their own mission. After a number of deceptions, the four travel together. In the end, they help each other with their missions and there is even the chance for love. I don’t like gore and guts. I like comedy and romance. So why do I like this movie? The gore and guts are just props for a classic rom com. This is a pretty funny movie and very cleverly made. There’s a great scene with Bill Murray that really makes the flick. You do have to ignore the violence, it’s not against people, it’s against zombies. That said, you get used to it as the movie goes along and you notice the romantic sub-plot more than the killings. Great film, you have to watch it but maybe not with little kids. Posted on 25/07/2011, in the whole rom com list, zom coms and tagged Abigail Breslin, Emma Stone, Jesse Eisenberg, Woody Harrelson. Bookmark the permalink. 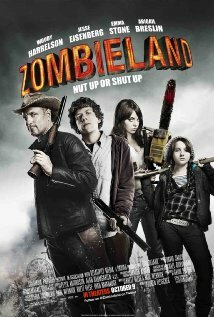 Comments Off on Zombieland.